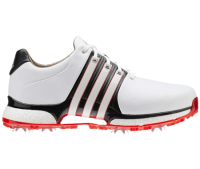 The Tour 360 XT gives adidas back to back wins in the spiked shoe category. The adidas flagship offering ranked no worse than second for any metric we consider. It offers excellent arch support and an updated sole design that provides superior traction. For those focused on comfort, adidas’ boost foam provides just the right amount of cushioning. 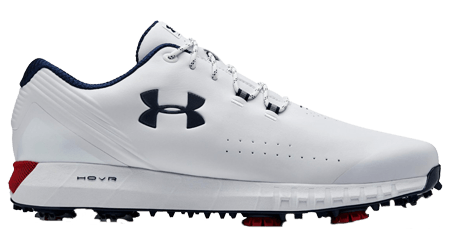 Under Armour’s newest spiked golf shoe, the HOVR Drive, is easily the best and most stable the company has produced to date. The traction is superb, while a softer heel cup provides improved comfort. Last season’s winner, the adidas Tour 360 2.0, again proved difficult to beat. The 2.0 offers a stable platform that gives you the freedom to really go after it without spilling out of your shoes or losing traction. 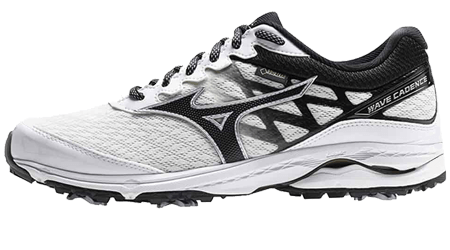 The IGNITE PWRADAPT offers outstanding traction and stability while still being flexible enough to allow the shoe to adapt to the ground. As you’d expect from PUMA, the PWRADAPT Leather brings modern styling with above average comfort. 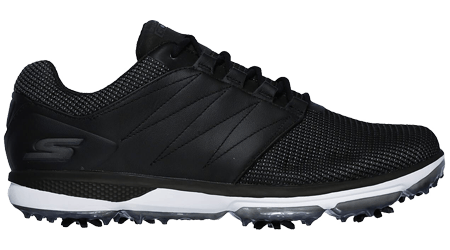 The Pro V.4 is the latest in a growing line of strong golf offerings from Skechers. Perhaps a slight step backward from the previous model, the V.4 is still insanely comfortable and that comfort doesn’t come at the expense of performance. 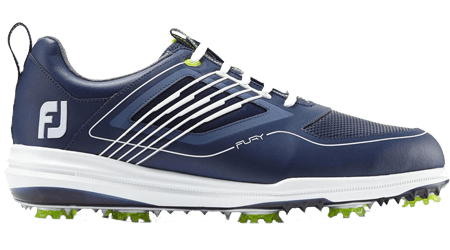 Despite the emergence of the spikeless golf shoe category, there are still many who prefer spiked shoes. While there are always exceptions, spiked shoes often provide better traction in wet conditions, and for golfers who need it, the additional stability that is sometimes traded for the versatility that makes spikeless shoes great for casual wear or for going straight from the office to the golf course. 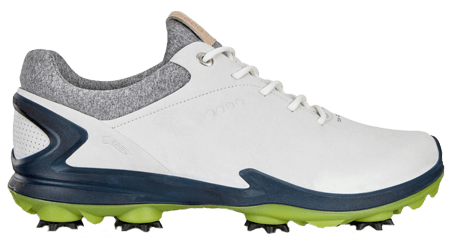 At the same time, manufacturers have responded to the changing trends by leveraging new and often lighter materials and placing a significantly greater emphasis on comfort without sacrificing the traction and stability golfers demand from their footwear. Simply put, these aren’t your grampa’s wooden-soled, metal spiked blister-makers. Whether you’re looking to buy a new spiked shoe today, looking for some buying advice, or just want a closer look at what’s on the market right now, this guide will help you find the right spiked shoe to fit your needs. We're here to help you find the perfect spiked shoe for your needs. It’s important to understand that a significant portion of comfort comes from proper sizing. If you have a wide foot, you absolutely should gravitate to brands that offer wide sizing. The same is true for the narrow-footed among us. Every aspect of golf shoe performance begins with a proper fit. The last thing you want is to slip or spin out during your swing. Seldom is a quality golf shot preceded by a slip. Traction is sometimes overlooked because many golfers assume that all spiked soles are created equal. That’s simply not the case. Some designs provide significantly better traction with the biggest differences emerging in wet conditions. While stability – the feeling of having the foot locked in place during the swing – is generally regarded as important, it should be noted that some golfers prefer and benefit from a shoe that allows the freedom to move around the footbed a bit during the swing. That said, a shoe should never be so unstable that it allows the foot to spill over the edge of the footbed. 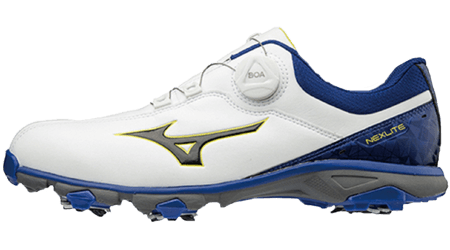 Many golfers will find stability among the most important considerations in a golf shoe. Well-designed heel cups, along with stable support structures play a role in enhancing stability. Are You Wearing the Wrong Size Shoe? Did you know that, according to FootJoy, over 70% of golfers are wearing the wrong size shoe? 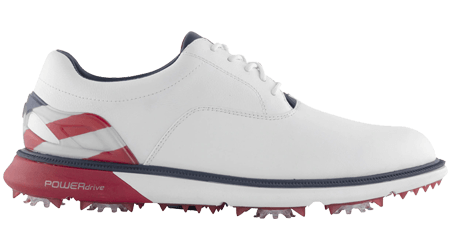 It sounds almost unbelievable, but the reality is that only a small percentage of golfers seriously consider width when purchasing golf shoes. Take the time to have your foot measured to ensure you buy a properly sized shoe. 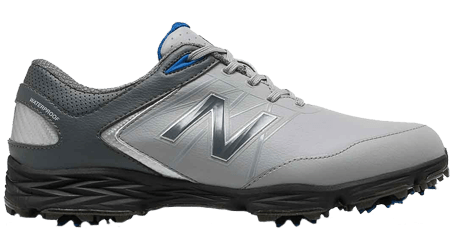 While it won't suit every golfer's eye, the New Balance Striker is a serious contender in the spiked shoe category. The shoe features a stable heel cup that helps keep your foot locked-in during the swing. The insole is one of the softest we tested, making it a fantastic walking shoe. EXPERT TIP - What Does Fit Really Mean? 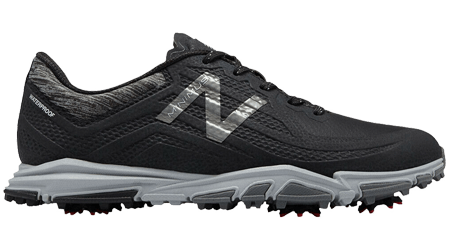 It cannot be overemphasized: Fit is the most critical element of golf shoe performance. As you likely know, sizing is often inconsistent from brand to brand and even from model to model. The length and width of supposedly same-sized shoes varies tremendously, as do other fit-related elements like the toe box, mid-foot section, and heel cup. You're going to want to ensure that the shoe you buy is snug, yet comfortable and requires next to no breaking-in time. Not everyone needs the most stable golf shoe one can find. It’s worth doing some experimenting with different shoe designs to determine what level of stability works best for you. For those who do require more stability, look for designs with some form of wrap technology in the mid-foot section to help keep you anchored in your shoe. BOA/DISC and lace systems sometimes secure the shoe, and ultimately your foot, differently than laces. If something doesn’t feel quite right in an otherwise comfortable shoe, it may be worth trying the BOA/DISC alternative when it’s offered. Note that these closure systems often increase the cost of the shoe. A healthy percentage of comfort comes from proper fitting. Take the time to have your foot measured to ensure you’re buying and wearing the proper size. 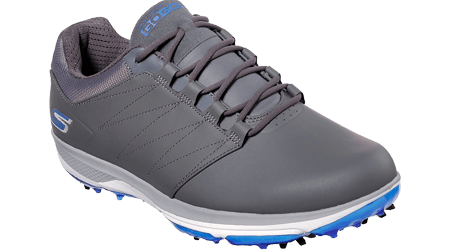 The BIOM G3 is major step forward for Ecco in unifying the comfort it's known for with a high-performance midsole and upper. The company is taking a unique approach to materials by constructing the upper on its BIOM G3 from Yak leather. Enhanced with a GORE-TEX membrane, the unusually soft and supple textured Yak leather easily conforms to the contours of your foot, making for one of the softest feeling shoes in our test. A re-engineered outsole helps push the BIOM G3's performance into the upper echelon. 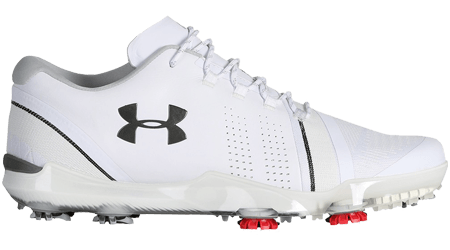 A: We’ve found that it’s possible to find a well-designed, fully featured golf shoes for around $90. That said, the majority of top performers, including our choice for Best Overall, are closer to $200. As with anything else, your rate of play should factor in the decision. 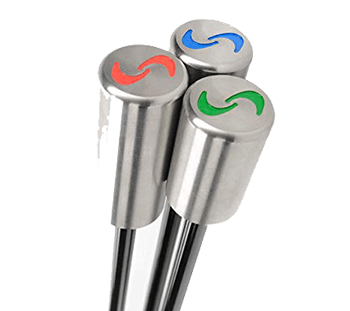 Golfers who play just a few times a year may be able to find a suitable offering for less. Just don’t skimp on comfort to save a buck. Q: What is the main feature I should look out for when buying a spiked shoe? A: Comfort is by far the most important factor, followed by traction. While stability is an important consideration, the level of stability needed varies between golfers. Only after you have those three considerations covered should style factor in the decision. 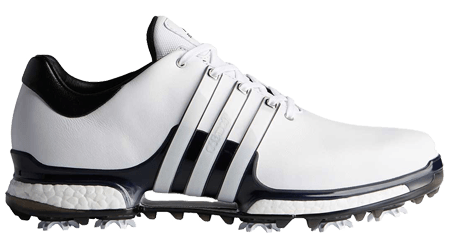 A: Some golfers prefer modern closure systems to traditional laces, but it’s certainly not a universal preference. Users of BOA and DISC report a tendency for their shoes to loosen throughout a round, and while that’s not a big deal to re-tighten, it can become an annoyance. Also consider that if a shoelace breaks, it’s easily replaceable, whereas warranty replacements for other closure systems can take some time. Bought a pair of these skechers about a year ago. They’ve split along one of the seams which I found very disappointing. The shop I’d bought them from had gone bust, when I went back to the manufacturer they didn’t want to know in spite of the two year waterproof guarantee. I don’t have wide feet per say, but I found the HOVR Drives to be too narrow in then midfoot. The outside ball of my foot seemed to bulge out and even hang over the edge of the sole a bit. I also tried a wide, but just fit too loose. Just wearing at home, the heel felt a bit to elevated also. Matt Kuchar is the only person I have ever seen wearing Sketchers. Nobody who isn’t getting paid wants to send the message to the world that they have flat out given up on life. I do agree that Sketchers could use a style revision. However, they are very comfortable. This from someone who has had my share of back surgeries, and these are the only golf shoes that I have been able to where comfortably. I just bought a pair of Adidas Tour 360 Boost 2.0. Great right out of the box. I liked them so much I bought another pair in Black/White. 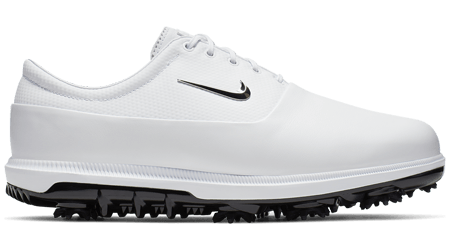 I’ve always been a Footjoy man but these are something else…. I recently puchased a pair of Adidas golf shoes, believing that their claimed wide fit would be the same as Footjoy. Nowhere near. Too tight in length and even tighter in the instep area (across the laces). Sent them back and replaced them with a pair 1/2 size larger. Better fit in length but almost as uncomfortable over the instep area (across the laces). Returned them. Enough was enough. Whatever last type they used wasn’t to my fit. Footjoy’s wide fit allows me to wear a size 9 (43 Euro) so going to a 9 1/2 was not sensible as previous experience had taught me that a larger, incorrect size would allow my heel to move and consequently rapidly wear out the padding and inner fabric around the heel making the shoe too loose. I have had my feet measured and find that a size 9 H is a correct fit for me. It appears that Adidas shoes do not cater for my fit. Pity. The do have some appealing styles. 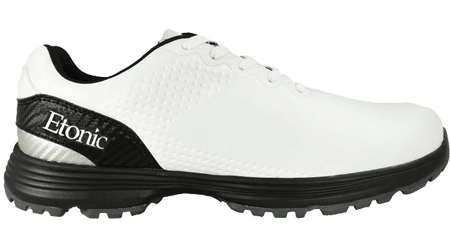 I now only trust Footjoy to “clothe” my feet because their sizing/width fit doesn’t require me to seek an incorrect size just so I can get them on. The article is great! My issue is FootJoy and the Nike Super Store are the only two that I can purchase shoes from. This is due to the size and half difference in my feet. I do purchase street shoes from Nordstrom as they a have a policy that supports the difference in sizes allowing my to buy one pair although mis matched. Nordstrom is limited on Golf shoes. FootJoy is the place for me as for as golf shoes go. Very interesting results, as I consistently have great experiences with Foot Joy shoes and conversely, bad experiences with Adidas. Will give them a try again. With 25 years in the athletic footwear industry, by some of the largest brands in the world. I read your article with great interest. Great shoes the adidas Tour 360, the most wonderful thing about this pick is out of the box comfort and support on day one as well as day 200. There is no other shoe like this. Oh sure there are some honorable models out there like Ecco Biom and FJ sl pro, but neither of these model feel the same after 30 days of use. The upper have far too much elasticity ( becomeing too loose) and the Midsoles EVA or EPS becomes lazy and compressed and eventually compromising the fit. Boost on the other hand keeps its shape and energy. Of course some of the comments will be infavor of Nike, all I can say is they’re way over priced, poorly made with the cheapest materials, construction and manufacturing technique. The last (shape of the foot they use) is generic and the same one they use on toddler shoes. Its a lifestyle brand. The pros are paid to wear custom made versions to look like the commercial models, you and I are not. Honorable mention in the footwear catalog would be New Balance Minimus for one of the lightest weight models, if you are on hilly terrain or feel winded a lot while walking. At sub 10 OZ very light weight. Sketchers unlike Nike they have a fairly simple design, quality is very good, Manufacturing also, the key to sketchers is they use a really nice fitting last and as a result fit very nicely. Golf shoes should fit like a glove not a mitten. Try a few on and let you foot do the talking in deciding which is for you, comfort 1st , fit 2nd . Ignore what is written on the box, or what size your street shoes are ( which are likely incorrect) and by all means not by marketing mumbo jumbo of who is wearing them. 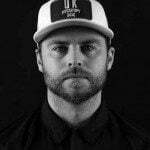 Thanks for the great education based on your industry experience. I’ve been a FJ and Skecher wearer as I need an XW fit, but am hoping that those Adidas shoes will fit me. How do you truly go about finding your size and fit?with your experience I figured I’d ask as I struggle with so many sizing issues between brands and function of a shoe, or that’s how it feels. I especially silly struggle with arch to length fit & blisters on the outside of my right big toe. I have an older pair of Tour360s that are still waterproof 5 years later. The day the new Boost XT came out, I bought a pair and walked 18 right out of the box. Extremely comfortable shoes. If you wear adidas boost running shoes, you will love the XTs. They are very stable and very comfortable. Not surprised they are #1. Any chance you could add in if the shoe offers a BOA/Disc option in the chart? 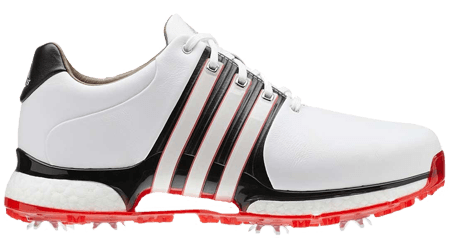 Just ordered some spikeless adidas golf shoes, and I can vouch for for the excellent arch support. I recently found out I have extremely high arches, and have never put any thought into arch support. But afterI put these on I immediately thought, I will be looking at adidas for shoes much more often now! Once I found Adidas 360 Boost a couple of years ago, have no use for any others. As a former Ironman Triathlete and having ran so many marathons, I learned long ago that a firm shoe that conforms & supports your foot is best,,,,NOT SOFT! That is a big misconception in the shoe industry. Why do some seek orthotics….not because they make shoes softer. Adidas seems to be making some of the best athletic shoes and apparel right now, I am sold. I am guessing that FootJoy did not submit any shoes to be tested. Would that be correct? One shoe model, per the chart. I feel that fit is number one here. I loved Adidas for a handful of years, but at some point either my feet changed, or their molds changed. I really love how Boost feels under my feet, so I’m disappointed that I had to stray from Adidas. 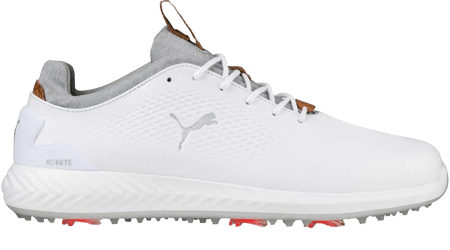 What fit this year for me was Puma Ignite Pwradapt (not leather) and, surprisingly, Callaway Balboa. The Cally’s do not have nearly the amount of cush underneath as the Boost I had to leave behind, but they just fit so well and are so comfortable, walking and taking shots feels just fine. And they’re extremely light! The Pumas are more of a supporting fit. I’m really squeezing my foot in, but they’re wrapped around the foot like a sock. I have a hunch they may have been going for a sockless fit with these? But it feels really good. The tongue (or lack thereof) is really nice too, no worries about a tongue moving around. So Adidas with the same design and appearance and etc. was selected #1 and 3 ?! I had a pair and they were like a brick on each foot and the size runs small the weight would drain you by the time the round was over. I couldn’t wait to get these ugly bricks off my feet! But I guess if your in for that punishment each to his own. The good thing about them is that their appearance hasn’t changed in years so if you have a pair from years back ,you are still in style..
What was the main reason why the Nike fell so far down the list this year? I know they produce about a dozen different styles but I’ve always been a fan of the Lunar Command 2 and now the React Vapor 2. They aren’t very comfortable when walking. Not a bad looking for the majority of golfers but performance wise, it is hard to justify looks for performance.